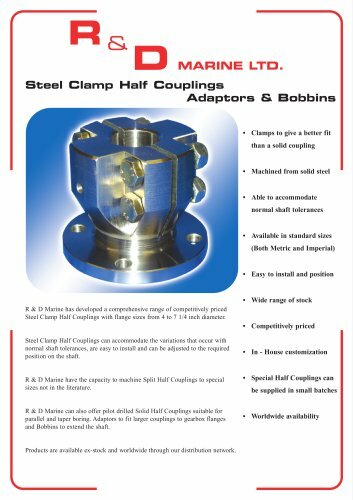 Clamp Half Couplings R&D Marine has developed a comprehensive range of competitively priced Steel Clamp Half Couplings with flange sizes from 4 to 7 1/4 inch diameter. Steel Clamp Half Couplings can accommodate the variations that occur with normal shaft tolerances, are easy to install and can be adjusted to the required • Clamps to give a better fit than a solid coupling • Machined from solid steel normal shaft tolerances • Available in standard sizes (Both Metric and Imperial) • Easy to install and position • Wide range of stock • Competitively priced R&D Marine have the capacity to machine Split Half Couplings to special Special Half Couplings can be supplied in small batches R&D Marine can also offer pilot drilled Solid Half Couplings suitable for parallel and taper boring. Adaptors to fit larger couplings to gearbox flanges and Bobbins to extend the shaft. Worldwide availability Products are available ex-stock and worldwide through our distribution network.